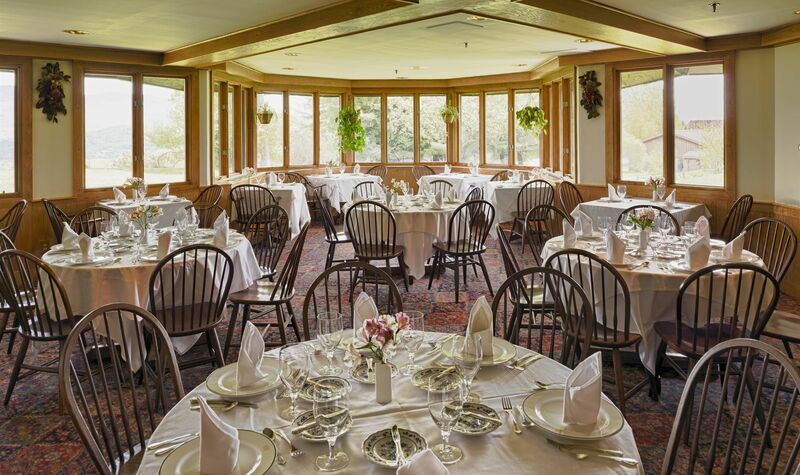 Enjoy European-style cuisine in the Main Dining Room of the Trapp Family Lodge. Open for breakfast and dinner, this expansive, wood-paneled room offers a relaxed, gourmet dining experience complemented with attentive service and beautiful mountain views. Add in farm-to-table ingredients and you have the recipe for a deliciously fresh meal that you won’t soon forget. The perfect way to start your day is with breakfast in our Main Dining Room. From 7:30am - 10:30am, we serve a bounteous Vermont country breakfast with all the trimmings. In the evening, join us for a candlelit dinner with your special someone. Choose the perfect appetizers, entrees, and desserts from our exquisite menu and allow our sommelier to introduce you to our award-winning wine list. Dinner is served from 5:00pm - 9:00pm, and reservations are recommended. Enjoy perfect seasonal flavors in our artisan salads, small plates and entrees, including Trapp Family Lodge harvested specialties. Our menu changes periodically to bring you the freshest flavors of every season. Top off the meal with traditional favorites made in-house to satisfy any sweet tooth. Click for the dessert menu.